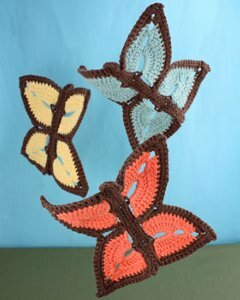 Time will flutter by as you crochet this sweet and whimsical butterfly dishcloth from Lily Sugar n' Cream. Protect your counters and your table with this cute crochet pattern. Size 4 mm (U.S. G or 6) crochet hook or size needed to obtain gauge. 1st row: (RS). 1 sc in 2nd ch from hook. 1 sc in each of next 6 ch. Ch 10. Sl st in fi rst ch - fi rst loop made. Note: here is a helpful clarification from one of our readers: "You have to slip stitch into the ENTIRE loop. Then proceed to do all the stitches in that loop." 1 sc in each of next 11 ch. Ch 10. Sl st in fi rst ch - second loop made.1 sc in each of next 6 ch. (1 sc. 1 hdc. 3 dc. 1 hdc. 1 sc) all in last ch. Working across opposite side of foundation ch, 1 sc in each of next 6 ch. Ch 10. Sl st in fi rst ch - third loop made. 1 sc in each of next 11 ch. Ch 10. Sl st in fi rst ch - fourth loop made. 1 sc in each of next 6 ch. 2 sc in last ch. Join with sl st to fi rst sc. Fasten off . First Wing: 1st row: (RS). Join B with sl st to fi rst ch-10 loop. Ch 3 (counts as dc). (7 dc. Ch 5. 10 dc) all in ch-10 loop. Turn.2nd row: Ch 3 (counts as dc). 1 dc in fi rst dc. 1 dc in each of next 9 dc. (3 dc. Ch 3. 3 dc) in next ch-5 sp. 1 dc in each of next 6 dc. (Yoh and draw up a loop in next dc. Yoh and draw through 2 loops on hook) twice. Yoh and draw through all loops on hook – dc2tog made. Fasten off . Second Wing: 1st row: (RS). Join B with sl st to second ch-10 loop. Ch 3 (counts as dc). (9 dc. Ch 5. 8 dc) all in ch-10 loop. Turn. 2nd row: Ch 3 (counts as dc). Dc2tog. 1 dc in each of next 5 dc. (3 dc. Ch 3. 3 dc) in next ch-5 sp. 1 dc in each of next 9 dc. 2 dc in last dc. Fasten off . Third Wing: Working into third ch-10 loop, work as given for First Wing. Fourth Wing: Working into fourth ch-10 loop, work as given for Second Wing. Join Wings:Right side: 1st row: Join A with sl st to fi rst dc of First Wing. **Ch 1. Draw up a loop in each of next 2 sts. Yoh and draw through all loops on hook – sc2tog made. 1 sc in each of next 8 dc. (2 sc. Ch 3. 2 sc) in next ch-3 sp. 1 sc in each of next 13 dc. 2 sc in next dc. Sl st in Body in 6th sc from Loop. Sl st in fi rst dc of Second Wing. Ch 1. 2 sc in same sp as sl st. 1 sc in each of next 13 dc. (2 sc. Ch 3. 2 sc) in next ch-3 sp. 1 sc in each of next 9 dc. Sc2tog. Sl st in Body in 6th sc from Loop. Turn. Left side: 1st row: Join A with sl st to fi rst dc of Third Wing. Rep from ** to ** as given for Right side. Where on the first loop do you sl st to? I found the instructions to be extremely difficult to follow. PLEASE send the instructions to my email. Thank you. Hi there, I sent you an email! Thanks for your comment, and good luck! This crochet dishcloth pattern is quite stunning. Butterflies are a beautiful sign of spring, so I would definitely display these in my kitchen. I really like this pattern. But, I had a terrible time trying to read the pattern. Whoever typed the pattern does not understand sentence structure. It is obvious no proofreading was done; the word "first" was typed "fi rst", overuse of periods, the word "off." was typed "off . ", overuse of parenthesis, sentences were jumbled, all this and more was found throughout the pattern. I am not a teacher, or any kind of instructor. I never complain about grammar issues, but I think Lily needs to know there is a problem. I like this project better as I feel it is more useful and something I would take the time to accomplish. Thanks for sharing. Make great Christmas gifts. Lovely, whimsical pattern. Colors are vibrant and it will match my filet crochet kitchen curtain. I like butterfly anything, so the butterfly dishcloths are the pattern I'd pick hands down! I like both of them but think the butterfly would be nicer to look at. thanks for putting up different ideas for everyone. Spring, beauty. That is what these butterflies remind me of. It would make a beautiful addition to any kitchen. butterfly one....definately (did I spell that right?) the butterfly one. Though I think the starfish one would actually work better as a dishcloth. I like the butterfly one better. I like both the butterfly and starfish patterns. As for making them for someone I'd have to go with the butterfly. Most people would prefer butterflys as you can easily match the colors in a person's kitchen or use that persons favorite colors. These are so unusual. I will probably make them both but my favorite is the butterflies. I love butterflies in any form! I like this one better than the Starfish one, but will probably make the Starfish one for my ocean themed bathroom. Butterflies are always number one though. I love Butterflies so must pick that one. I am a butterfly person!! I like starfish, but anytime I must choose between butterflies and any of God's other birds,fish, or other wildlife, I'll take butterflies, hands down!!! These are very pretty. I doubt I will use them for Washcloth's though, because they are too pretty, great for small, heavy vases, etc. One odd thing though, me being me, almost every first has a split in the middle. :) Had to correct every one. Oh, and also to fix the fi rst's easily, if you have Word just go to the replace tab on the right and enter the fi rst in the first box and first in the second box and click replace all. Much faster than the one by one I did the first time. Do I have enough firsts in this reply? he he.